Nowruz, or “New Day”, that also spells “Norouz”, “Norooz”, “Noruz”, etc. is the most joyful festival of Iranians (Persians). 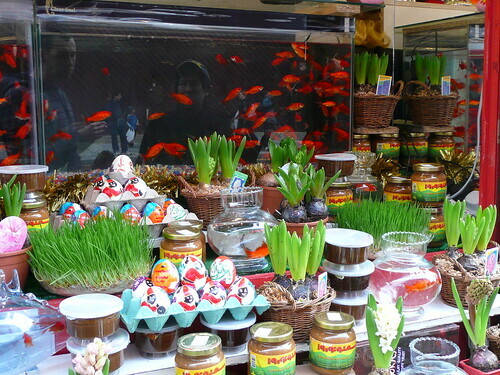 The Persian Nowruz begins on the first day of spring (usually the 21st of March). The 21st of March, therefore, is equal to the 1st day of Farvardin, the first month of the Persian Year. As far back as records go, Nowruz has been, either in fact or by intention, a celebration of early spring, when the sun begins to regain strength and overcome winter’s cold and darkness and when there is a renewal of growth and vigor in nature. The return of spring would have represented an annual victory for the Spirit of the sun; and Zoroaster saw in it also, it appears, the symbol of a still more glorious victory to come Today, the festival of Nowruz is celebrated in many countries that were territories of the Great Persia: Afghanistan, Tajikistan, Uzbekistan, Azerbaijan, Turkmenistan, Kazakhstan, Georgia, Kyrgyzstan, Iraqi Kurdistan, Turkey Kurdistan, Azerbaijan, Kashmir, Albania, etc. It is also celebrated by the Zoroastrians in Pakistan and India, by Parsis in the Indian subcontinent, and by Aryans in China, Balkans, etc. According to Britannica, The Jewish festival of Purim is probably adopted from the Persian New Year. Tradition takes Nowruz as far back as 15,000 years and that goes beyond the last ice age. The mythical Persian King Jamshid (Yima or Yama of the Indo-Iranian lore) symbolizes the transition of the Indo-Iranians from animal hunting to animal husbandry and a more settled life in human history. Seasons played a vital part then. Everything depended on the four seasons. After a sever winter, the beginning of spring was a great occasion with mother nature rising up in a green robe of colorful flowers and the cattle delivering their young. It was the dawn of abundance. Jamshid symbolizes the person/people who introduced Nowruz celebrations. The Shahnameh, dates Nowruz as far back to the reign of Jamshid, who in Zoroastrian texts saved mankind from a killer winter that was destined to kill every living creature. In the Shahnama, Jamshid constructed a throne studded with gems. He had demons raise him above the earth into the heavens; there he sat on his throne like the sun shining in the sky. The world’s creatures gathered in wonder about him and scattered jewels around him, and called this day the New Day or Now-Ruz. This was the first day of the month of Farvardin. The famous Persepolis complex, or at least the palace of Apadana and the Hundred Columns Hall, were built for the specific purpose of celebrating Nowruz. In 487 BCE, Darius the Great celebrated the Nowruz at his newly built Persepolis in Iran. There is a detailed account by Xenophon of Nowruz celebration taking place in Persepolis and the continuity of this festival in the Achaemenid tradition. The Nowruznama, Omar Khayyam, provides a vivid description of the celebration in the courts of the Kings of Persia. In addition, the Arsacid period provides the earliest description of Nowruz festivities. This comes from the romantic epic Vis u Ramin, which was identified by V. M. Minorsky as by origin a Parthian oral work. Known as the traditional herald of the Nowruz, Haji Firuz is a black-faced character clad in bright red clothes and a felt hat playing a tambourine and singing, “Haji Firuze, sali ye ruze.” (It is Haji Firuz time, it happens once a year!). Haji Firuz is believed to be based in a tradition called “Mir-Nowruzi”. Mir-Nowruzi was a comical figure chosen to rule the municipality for the last five days of the year (also called Panjeh). 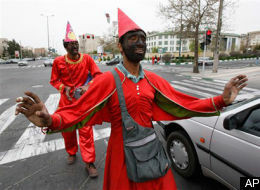 The temporary five-day king would often parade the city with a group of singers and dancers for the Nowruz Celebrations. The sound of his songs and the sight of his dance is often analogous to hearing Christmas music in a shopping mall, telling all that Nowruz is in the air. This entry was posted on Thursday, March 17th, 2011 at 7:16 pm and is filed under Persian History and Culture. You can follow any responses to this entry through the RSS 2.0 feed. Both comments and pings are currently closed.